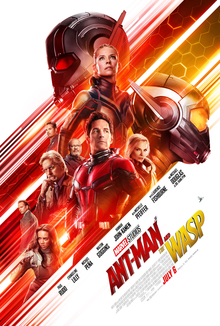 Ant-Man and the Wasp is a 2018 superhero movie based on the Marvel comics characters of the same names, and is a sequel to the 2015 movie Ant-Man, and also sort of a sequel to the 2016 movie Captain America: Civil War. After the events of Captain America: Civil War Scott Lang aka Ant-Man (Paul Rudd) was put on house arrest for…something he did in that movie which this movie does not exactly make clear (and I haven’t seen Civil War, so, go look it up yourself if you want to know). His daughter from his previous marriage can visit him there, so he spends most of his time making new games to play with her. At the end of the Ant-Man movie, Scott Lang (Paul Rudd) as Ant-Man succeeded in shrinking down to the quantum realm and returning, which the inventor of the shrinking suit Hank Pym (Michael Douglas) had thought impossible. Ant-Man is a 2015 superhero film based on the Marvel comics characters of the same name. Hank Pym (Michael Douglas) is the inventor of a suit that allows the wearer to shrink and grow. When the wearer is small, their punches land with the same force as when they’re full size, but concentrated onto the area of a pinhead. Pym worked for S.H.I.E.L.D. using the suit until 1989 when he resigned when he learned that they were trying to replicate the suit technology for military applications, and started his own company: Pym Technologies. In the present, Pym’s daughter Hope Van Dyne (Evangeline Lilly) is working with Pym’s former protege Darren Cross (Corey Stoll), to force Pym out of his own company. Cross is determined to reverse-engineer Pym’s shrinking suit, and keeps on trying despite failure after failure.